The V2X Solution gives users easy access to V2X communication from Simulink and enables graphical analysis of V2X-specific data in ControlDesk. Engineers can reduce their workload and focus entirely on developing and testing V2X applications without having to implement specific communication protocols and software layers. 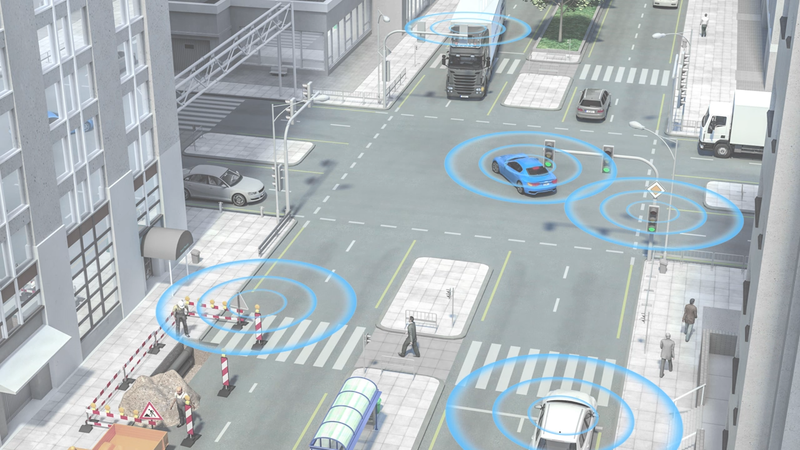 V2X (Vehicle-to-X) technology enables the exchange of data between vehicles and between vehicles and the infrastructure via wireless ad-hoc networks according to the IEEE 802.11p standard. The network participants send messages that include information about details such as their position, speed and driving direction or events such as traffic jams. In Europe, the CAR 2 CAR Communication Consortium (C2C-CC) cooperates closely with the standardization organizations ETSI (European Telecommunications Standards Institute) and CEN (Comité Européen de Normalisation) to develop joint communication standards. In the US the family of standards for Wireless Access in Vehicular Environments (WAVE) and the SAE (Society of Automotive Engineers) J2735 V2X message set are applied. The dSPACE V2X Solution facilitates the easy access to V2X communication from Simulink® and the graphical analysis of V2X data. Engineers can focus entirely on developing and testing the actual V2X applications without having to implement the required V2X-specific protocols and software layers themselves. The dSPACE V2X Blockset for Simulink is a central component of the V2X Solution and lets engineers easily access WLAN ad-hoc communication according to the IEEE 802.11p standard. The blockset can be used for rapid control prototyping and model-in-the-loop (MIL), software-in-the-loop (SIL) and hardware-in-the-loop (HIL) simulation. In only a few steps, developers can connect their applications directly to the appropriate communication blocks. Implemented protocols and software layers perform further steps, such as encoding and decoding V2X messages, and enable the communication to a V2X hardware adapter. Incoming messages can be stored and filtered by means of the Local Dynamic Map (LDM). The blockset supports vehicle- and infrastructure-related messages that comply with the European and US standards. Moreover, developers can easily adapt existing messages and expand the blockset by importing further application protocols from ASN.1 description files. The direct access to all V2X signals within the model also simplifies data manipulation, e.g., during robustness tests, and the map instrument in ControlDesk allows an easy analysis of the corresponding effects. All this helps engineers reduce their workload so they can focus completely on developing and testing their applications. SAE J2735 message set rev. 2016 with Basic Safety Message (BSM), Signal Phase and Time (SPaT), Map Data (MAP), etc. The V2X blockset provides dedicated blocks for handling V2X messages. The contents of each message are provided as signal vectors in Simulink. Users can configure a filter for V2X signals, so only the message contents that are relevant for an application are displayed in the modeling environment. The coding and decoding blocks are derived from the ASN.1 description files standardized by ETSI and SAE. Incoming V2X messages are stored in the LDM and the relevant message contents can be distributed to individual V2X applications. The Simulink model is connected to the radio channel via Ethernet and a suitable V2X hardware adapter, such as the MK5-OBU by Cohda Wireless. The V2X Solution enables developers to adapt existing V2X messages and expand the blockset with new message types. This requires them to compile the appropriate ASN.1 protocol description files by means of the optionally available compiler. The precompiled protocols can then be imported into the V2X blockset as custom encoding and decoding blocks. In addition to the V2X-specific blocks, the V2X Solution offers a dedicated blockset for encoding and decoding GNSS data according to the NMEA 0183 standard. The V2X Solution extends dSPACE ControlDesk with a specific map instrument, which is continuously updated with new data from the LDM. The map instrument therefore always displays the same contents that are available to the V2X applications, e.g., the position, velocity, driving direction and classification of individual traffic participants and other V2X-specific information. The configurable map instrument lets you conveniently perform data analysis and plausibility checks for V2X applications.